What Is Unmedicated In Vitro Fertilization? It was observed that certain patients are sensitive against medication used for in vitro fertilization and such sensitivity could cause oedema in the abdomen and lungs (ovarian hyperstimulation syndrome- OHSS) due to unexpected, excessive response of the ovaries. In vitro maturation treatment is preferred particularly with PCOS (Polycystic Ovary Syndrome) patients with high risk of OHHS development due to this sensitivity. Further, it can also be used with endometriosis patients, patients with low response to medication and in case of male infertility. 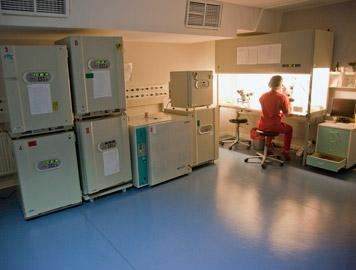 In vitro maturation treatment is an ideal method particularly for patients who are prohibited to have hormone treatment. Inability to obtain the desired quality of eggs at all times and slightly lower pregnancy rates. The treatment is not suitable for elderly patients. IVM pregnancy rates are within acceptable limits (30%). Total duration of the IVM treatment is 8 to 10 days, and duration that our patients are required to spend at our clinic during the treatment is half an hour for each visit which is in total 1 to 2 times. The cost of the treatment is same as the conventional IVF treatment, but discount in medication costs up to 90% is available. This method of treatment can be provided by a small number of IVF centers in the world and in Turkey.